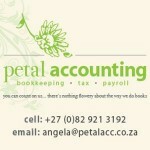 Petal Accounting is an accounting business situated at 34 Riley Crescent in Howick, KZN. Trading as a Sole Proprietor, the business is run and managed by Angela Ferguson who has more than twenty years experience in financial management and tax administration. Angela is also a Registered Tax practitioner and is able to assist her clients with regard to tax queries, tax clearance certificates and all other aspects of tax compliance. We do not sign off Annual Financial Statements. However, we do and can prepare books of account in financial statement format and work together with a number of Accountants and Accounting Firms in the Howick and greater Pietermaritzburg and Durban area for sign off. This we find assists our clients in terms of affordability as well as efficiency in getting the books of account timeously prepared. Our rates are very competitive and we welcome your enquiries in order to offer you a quotation for services to be rendered in respect of any aspect of the above.